27th February, a day to celebrate & commemorate charitable acts done by NGOs around the world! Declared in 2010 by the 12-member countries of the IX Baltic Sea NGO Forum of the Council of the Baltic Sea as the World NGO Day, it’s a day of honoring the spirit of philanthropy. A number of Indians have put on the philanthropic hats and gone out of their ways to bring in positive changes to the country. Be it in education, healthcare, gender rights or wealth gap, it is through the charitable steps taken by these personalities that make the world a better place. Labelled as the ‘Most Generous Man’ several times by multiple organizations, Azim Premji, Chairman of Wipro Limited, has been known to have donated about half of stake-holding in Wipro to charity work. Subhash Chandra, Chairman of Essel Group, has contributed as much as Rs.5,000 crore for philanthropy. Similarly, there are multiple NGOs that have achieved a distinctive spot in philanthropy. Any individual, irrespective of class, can take up philanthropic work. All it takes is the will and the spirit to make peace, equity and justice the status quo. There are plenty of ways you can make use of your time for charitable undertakings. 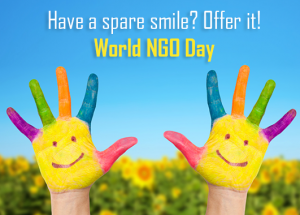 You can always join any NGO that is working in the sector that you want to contribute to. If you wish to start a philanthropic venture on your own, there are numerous ways that can be approached too. Given the right guidance and mentorship, you can form your own organization. All you’ll need is a group of like-minded people who are willing to make a change. When it comes to dealing with disability, youth empowerment, healthcare and hunger, Ponty Chadha Foundation too is trying to contribute to the nation. With our Mata Bhagwanti Chadha Niketan, we have embarked on a mission to gift a life of self-sufficiency and dignity to the differently-abled. Our Kulwant Singh Chadha Skills Academy plays a crucial part in empowering the youth of our nation and enabling them to support themselves. In the similar way, the regular health camps and food distribution drives strive to usher in accessible care to the marginalized. We are all capable of making a change that turns the world into a happier place. Let’s pledge to start on our own this World NGO Day and give peace and equality another chance. This entry was tagged Azim Premji, Kulwant Singh Chadha Skills Academy, mata bhagwanti chadha niketan, philanthropic work, philanthropy, ponty chadha, ponty chadha foundation, positive changes to the country, Subhash Chandra, World NGO Day. Bookmark the permalink.